The new ferry routes will include Astoria, southern Brooklyn, the Lower East Side, Soundview in The Bronx and Rockaway Beach. NEW YORK CITY — Say goodbye to the East River Ferry. Coinciding with Monday's launch of the NYC Ferry, the East River Ferry operations will be taken over by the new citywide service and its one-way fare will drop to $2.75 from its current $4 weekday and $6 weekend fares. The city-subsidized NYC Ferry, earlier called Citywide Ferry, will launch Monday with one new route from the Rockaways to Wall Street — and the existing East River route. On June 1, it will start a South Brooklyn route and in August, the Astoria route will debut. All one-way fares will be priced at $2.75. The $1 fee to take a non-folded bike remains the same. Service begins at 6:30 a.m., according to NYC Ferry's East River schedule. For service starting Monday, even for the East River route, tickets can be purchased through the new NYC Ferry app. A 30-day pass is priced at $121 or $141 with a bike. Tickets will also be sold at ticket vending machines at ferry landings or via agents at Pier 11 and 34. While ferry riders can transfer for free to another boat in the same direction within 90 minutes, there is no transfer to the MTA's buses or subways. 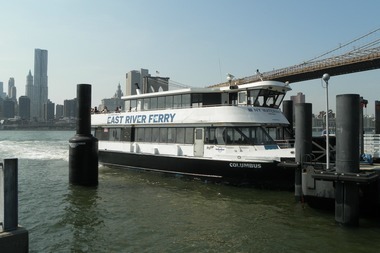 The East River Ferry currently serves Pier 11 at Wall Street in Manhattan; DUMBO at Pier 1 of Brooklyn Bridge Park: South Williamsburg's Schaefer Landing; North Williamsburg at North 6th Street; Greenpoint at India Street; Hunters Point South/Long Island City; East 34th Street in Midtown; and Governors Island when it is open for the season. This year, Governors Island opens for the season May 1. In 2016, nearly 1.6 million trips were taken on the East River Ferry, an 8 percent increase from the year before, according to the New York City Economic Development Corporation.